Brendan Bowers is a digital marketing professional and writer from Cleveland, Ohio. His work has been published in SLAM Magazine, Kicks Magazine, Bleacher Report, Small Business Trends and elsewhere. He also once operated a Cavs blog called StepienRules.com and enjoys long walks down Euclid Avenue during victory parades. He is a proud member of the Linkmedia 360 team and graduate of Case Western Reserve University. His first book, "Cleveland Is King! The Cleveland Cavaliers' Historic 2016 Championship Season", was a The New York Times Best Seller. Ryan Jones is the author of King James: Believe the Hype-The LeBron James Story. He was the editor for SLAM magazine for 10 years and currently works at Penn State University. He can be reached on Twitter @TheFarmerJones. In American society, athletes often transcend their sport to become iconic pieces of our shared culture. Their names, faces and accomplishments define not just their careers, but the cities they play in and the fans who support them. These players strive to be the greatest of all time, and each generation hoists its hero to the rarified air of legendary talents. LeBron James is our generation’s best. But is he the best ever? LeBron James vs. The NBA is more than a statistical analysis of basketball greats. Bowers incorporates the numbers into a comprehensive analysis of intangible, unquantifiable qualities that define players’ legacies. 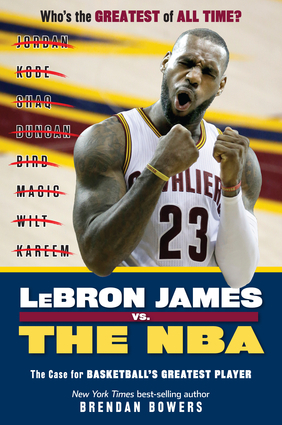 In doing so, this great new title proves LeBron’s place as the greatest of all time. No basketball fan’s library is complete without it. Brendan Bowers is a digital marketing professional and writer from Cleveland, Ohio. His work has been published in SLAM Magazine, Kicks Magazine, Bleacher Report, Small Business Trends and elsewhere. He also once operated a Cavs blog called StepienRules.com and enjoys long walks down Euclid Avenue during victory parades. He is a graduate of Case Western Reserve University. His first book, Cleveland Is King! The Cleveland Cavaliers' Historic 2016 Championship Season, was a New York Times Best Seller.